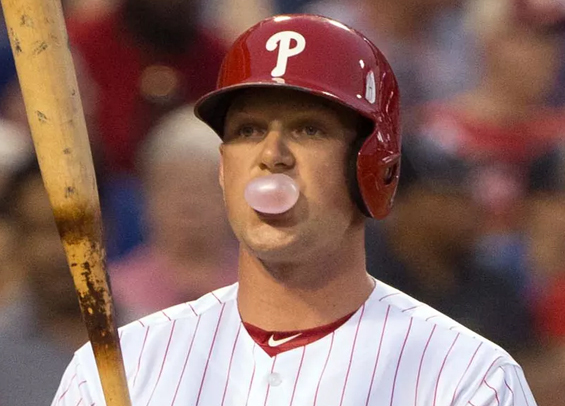 The outfield experiment may be coming to an end finally for Rhys Hoskins. According to general manager Matt Klentak, the slugger will see a lot more time at first base next season and will see his time in the outfield trimmed significantly. This means Carlos Santana will likely slide across the infield to third base, leaving current third baseman Maikel Franco expendable. Hoskins played first base throughout his minor league career and was moved to the outfield on a full-time basis to make room for Santana. In 165 games over the span of two seasons, he committed seven errors and showed extremely poor range with -25 runs saved according to BIS's Defensive Runs Saved Above Average metric. It's not a surprise that when asked about his preference last season, Hoskins said he'd like to be back at first base. "We would probably be looking at Rhys playing some left and some first and Carlos playing some third and some first, as opposed to this year where it was close to 100 percent of the time Rhys in left and Carlos at first," Klentak told reporters last week during the general managers' meetings in California. Manager Gabe Kapler is also on the same page, agreeing that Hoskins needs to spend more time at first base. "He's been a team guy, he's earned that right and I think we need to look into granting his request," Kapler said at the end of last season. Of course, for all of this to happen the Phillies will need to sign an outfielder that can play in the corner, ala Bryce Harper. In that situation, Nick Williams would slide from right to left and Harper would be in right.